I love to take photos on my yard. You might see a lot of life, if looking closely. I spotted this purple wildflower near our garage. A ladybug was taking her walk on it. Below is Frank Leto's animated song Ladybug, Ladybug from YouTube. I thought kids might like it :). Have a great weekend, everybody! These wildflowers are so pretty, you should try doing a macro of it. Good shot. That took me a moment to find. Very nice. The song is cute, too. Have a great weekend! A very simple and common subject and yet you made a real beauty out of it. I have much respect for your artistic skills. Lovely! You asked about macro Rosidah! My closeups/macro today is way much better after I bought the camera I have now. Earlier I had one of those small cameras you can put in your pocket. I got some nice one also then - but none of them can compeet with the macro I take now! And that is beacause I can near the camera so much. Hope it was helpfull! And just ask if my explaination wasn't good enough! Have a nice weekend Rosidah! Very pretty flower & cute video! I always think of Lady Bugs as the sweetest of the bug world! The video was cute too. Thanks for your visit. I'm very happy to be the guest friend today and you were the first to visit me, but my post entered just now. Could you go there again? There is a surprise. Tattibeu is rigth, you made a beauty from a simple and common subject . Great shot of two pretty things together! An addition to what Valkyrien said: most cameras go into macro mode when when one of the directions on the four-way controller is pushed, usually left or down. It'll be indicated by the tulip/flower. Thanks for comming back, I loved it! Thanks for sharing, you have a great weekend too! Beautiful shot Rosidah! Love the ladybug on the flower. I will capture the bug myselfs if I found them on the flowers. Have a nice day..
Lovely wildflowers and ladybug. This is a nice photo. Ladybugs are so pretty and useful in the garden. Nice wildflower and educational song as as well. Two memes in one great shot! Love it! I saw my first lady bug in my Canadian garden! A good sign that Spring is here to stay!! You probably enjoy sunshine most of the year! Good entry! What do I love more? Your great shot with a bug or cute Lady Bug song? 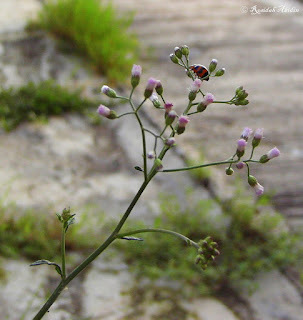 Beautiful wild flower and what a cute bug! I forgot I had been here for Camera Critters! pretty violet little flower. great capture of a bug. lovely cute violet flowers. i love violet color, it's my favorite color. thanks for sharing it brightens my day. Wonderful post and thank you for sharing your flowers with Today's Flowers. A bug? Urgh. But sometimes, bugs are cute. So is the wild flower. Something wild can also sometimes be pretty. You got two for one! Pretty flower and I enjoyed the lady bug song. Thanks for the visit! Great close-up shot of the lady bug visiting the flower, Rosidah. ah sweet photo of flower and lady bug. So delicate. I wonder what kinda bug that is. Pretty and makes me think of warmer days!